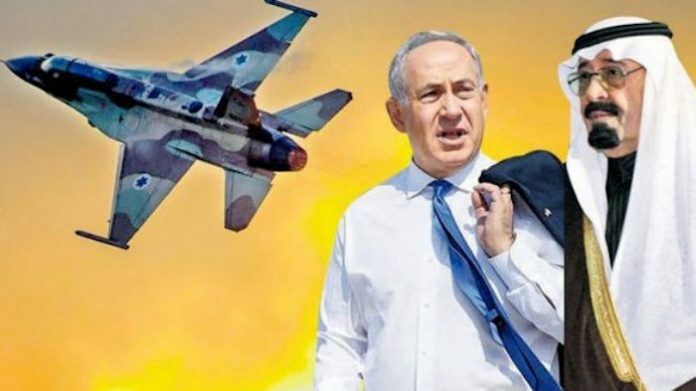 HomeNewsMiddle EastLeaked Documents: Saudi Arabia And Israel Forming Joint Military? Documents leaked in 2014 from a senior military official linked to the left-wing “Meretz” party, appear to show an aligned military cooperation between Israel and Saudi Arabia in the Red Sea. This agreement is concluded to Saudi Arabia and Israel management on Bab el-Mandeb Strait, the Gulf of Aden and the Suez Canal and the Red Sea littoral countries as well. Published information from this source mention in duty of a host by Israel of a number of officers Arabia to participate in military training courses in the base of polonium of Port of Haifa in 2015. And this attempt has taken on Israel-Saudi Arabia cooperation to support regional security and stability and combating terrorist groups in the Red Sea. The source informs also the formation of a joint operation staff by Israel and Saudi Arabia in Tiran Island. Also behalf of Israel, Colonel “David Salami”, and behalf of the Saudi Arabia, Major-general “Ahmed bin Saleh Al-Zahrani ” were selected as the joint commander of the Navy. Command School and specialized courses: number (nine) officers and (1) graduate. Though Israel and Saudi Arabia do not have formal diplomatic ties, the Jerusalem Post reports, “the two countries do have third-party economic ties which see Israeli products – agricultural and technilogical [sic] goods – arriving via the Palestinian Authority, Jordan or Cyprus.” According to the report, Iran is seen as the number one threat to both the Saudis and Israelis. As a result of their common fear, the Saudis have given Jerusalem “approval for Air Force jets to pass through their airspace” in the past, just in case the Jewish state decides to attack Iran’s nuclear facilities. To security experts like Yossi Melman, the Red Sea deal is “likely the continuation of these contacts as was published and the common interests between the two countries.” While Melman concedes the “covert ties are unlikely to come to the surface,” details concerning the memorandum leaked by Meretz and reported by Muslim Press haven’t received much attention from the establishment media.